difference between the intake air and exhaust gases. It is almost similar to turbojet engine, the only difference is the turbojet engine has a compressor where as ramjet has no compressor. air intake must have a proper aerodynamic design otherwise it’ll cause the whole engine system to fail even if the other parts are designed perfectly. It is an aerodynamic shaped surface whose area is less than the area of air intake. It’s not present in every engine, only high speed engines. It causes air press to rise inside the engine without increasing the air-intake velocity. It creates a narrow path for the intake air to move into the engine blocking the intake, thus increasing the pressure. The pointed cone shaped material in front of the Brahmos missile is a inner body of the ramjet propulsion it uses. It injects fuel inside the engine. Now the high press air is mixed with the fuel and it is ignited by the injector. The engine efficiency depends upon design, air-fuel mixture and control system of fuel-injector. It must be remembered that injecting more fuel than the critical value will cause less efficiency as the max thrust is limited by the amount of air intake. So more fuel than the sustainable limit causes unburnt fuel. Generally the igniter comes integrated with the injector system. It burns the fuel inside the engine. The more it burns the more thrust produced. At this part of engine the the air press builds up thus creating a difference in press with intake air. Thus creating a forward thrust. For ‘BASIC’ type of ramjet there is a limit, if exceeded it causes leaking of pressure through the air-intake thus causing the thrust to reduce. Generally this simple ramjet engines are limited to MACH 1.2 only. can produce Upto mach 6. Ramjet engine can’t produce power at low airspeed. So ramjet engined design required some other propulsion to achieve the velocity at which ramjet can produce power. And this is generally a first stage booster rocket system which provides initial propulsion. If any one of you have seen the BRAHMOS LAUNCH…notice the flight pattern. First the booster rocket fires and gives the engine enough speed to fire up the ramjet engine. Now a days there are more efficient ramjet which are able to create hypersonic speeds. Also in 5th gen aircraft the nozzle shape plays a vital role in stealth design. As the ramjet engine produce vast amount of thrust the nozzles are designed so as to minimize the infrared signature without affecting the engine thrust. injection system. Such as Liquid Fueled ramjet(LFRJ), Solid fueled Integrated Rocket Ramjet (SFIRRJ), Air Augmented Ramjet. 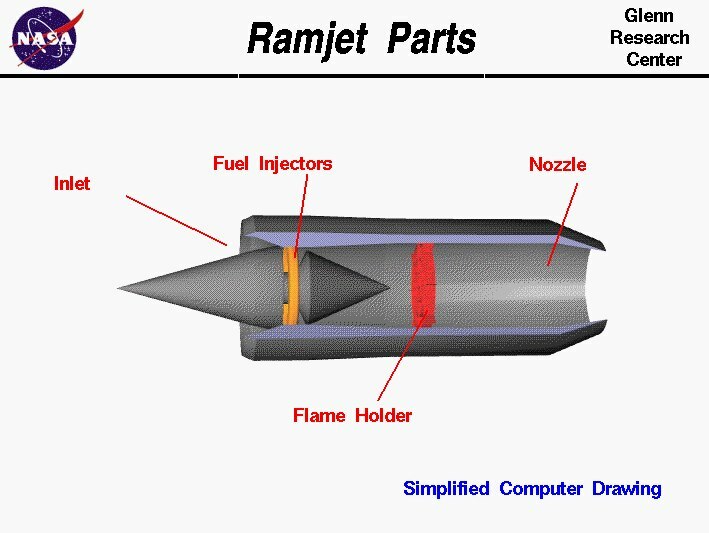 The ramjet system can be hybridized with other systems like rocket engines or turbo engines to create a hybrid and more powerful engine. Supersonic combustion ramjet (scramjet) engine is derived from ramjet with having higher mach number around hypersonic speed. Turboramjets have a turbofan at the intake to create more pressure inside the engine. To create an efficient ramjet engine the design must be properly carried out so that each condition can be satisfied for a sustained mechanism.